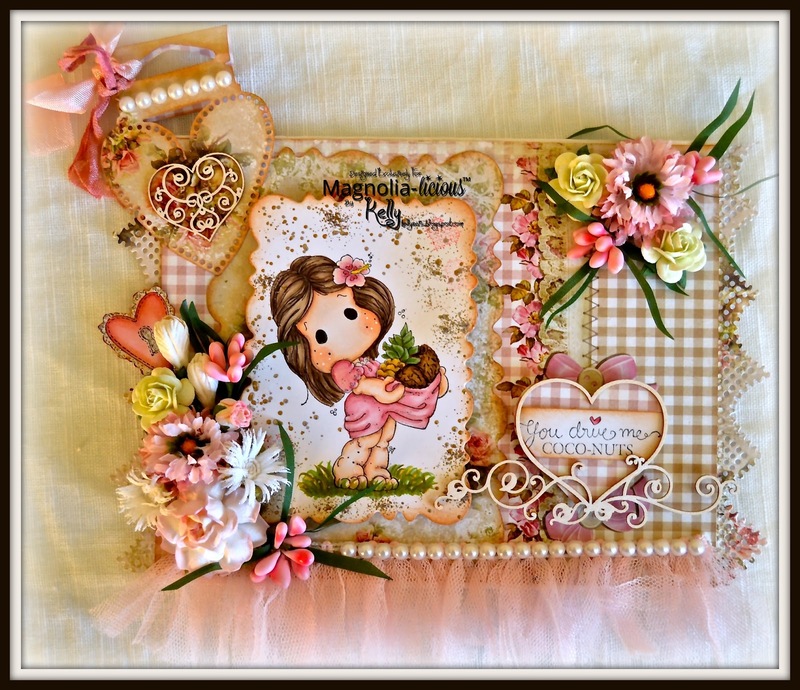 I would like to share my card for the Magnolia-licious Challenge "Hearts and Flowers" with you. 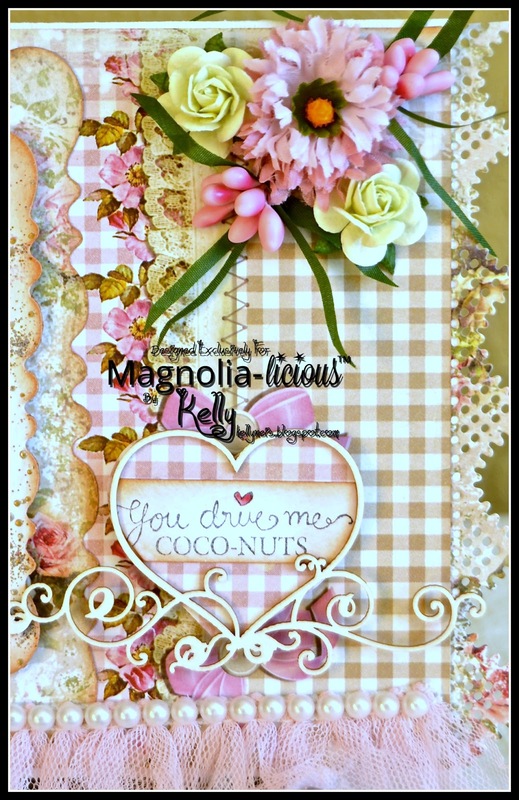 I used Coconuts Tilda from the new collection Lovely Duo, you can find her at the Magnolia-licious Store. I fell in love with some new papers from LemonCraft at a store called Stay True To God. They are so beautiful and she has a lot more so I hope you check out her store. The sentiment that goes with Coconuts Tilda is framed in a heart, "You Drive Me Coco-nuts". Very cute sentiment. 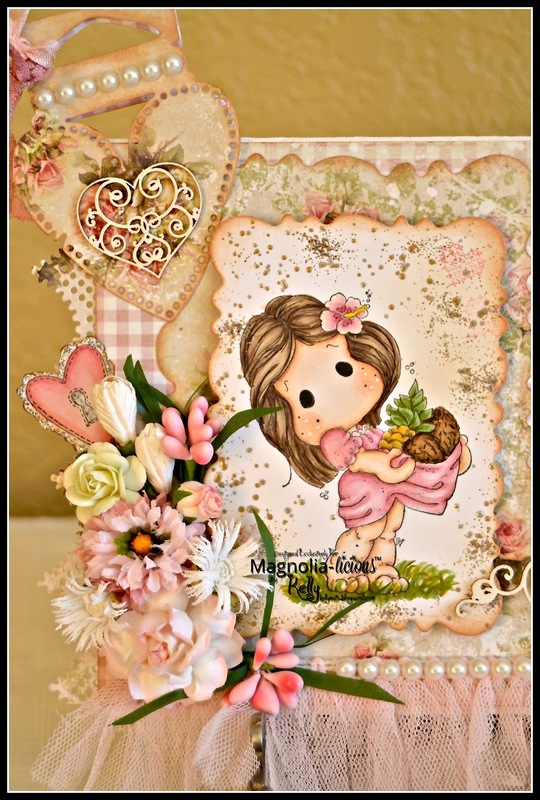 You will notice at the top is a fluffy pink flower, they are new from Magnolia and go with the new Lovely Due Collection and can be found at the Magnolia-licious Store also. Just click Lovely Due Collection and follow to the right until the matching flowers appears and click. Here are more of the gorgeous Magnolia flowers along the side of my card. Here is the inside, I just used one piece of Lemoncraft paper and look how pretty it is with now effort. Don't forget to comment on the Challenge Post and "W"ednesday posts. If you leave comments on our Design Team blogs and/or the posts on the challenge blog...you will be ENTERED to WIN!! The more blogs you comment on for each challenge or post, the better your chances to win! You only need to leave one comment per blog/post. Thank you for stopping by today and I appreciate all your comments. 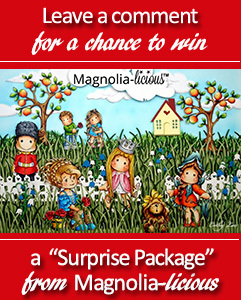 I hope you join us in the Magnolia-licious Challenge "Hearts and Flowers" because the prizes are so awesome! This is stunning Kelly. The image is adorable and so much gorgeousness with the embellishments. I saw on Facebook you are having meeting this week to ascertain what can be saved or not from the fire damage. I hope you get some hopeful news. Thinking of you. Gorgeous card, full of lovely details ! You've been on my mind like crazy and it was so great to still see a scheduled post from you. I love your beautiful masterpiece on a card with the ever elaborate and exquisite touches you always create with. You truly do make the world a better more beautiful place. Wishing all the best for the upcoming meetings and planning. Oh this is SO beautiful Kelly… Tilda is adorable and you've coloured her to perfection! the pretty papers and embellies are divine… really stunning! I really hope you've managed to salvage some of your things hun... have been thinking of you. Coconuts Tilda is just adorable and your colouring is just exquisite! Your embellishments are always perfection too. I love this! This is a gorgeous card with lovely colors and embellishments. You are in my thoughts and prayers. I hope all goes smoothly to get you all settled again. God Bless You All! Your card is gorgeous! Love your coloring and all those gorgeous embellishments. Thinking of you often! Stunning springtime colours and flowers - this is another beautiful creation, Kelly. I can only imagine how discombobulating it must be to be going through such stress and trauma in real life while such delicate, beautiful creations keep appearing here on the blog.